Silence. It’s what you heard during the lunch hour on Friday, April 11. Upper School students, joined by faculty members, sat in a circle, side by side in honor of the National Day of Silence. A large group of students took time away from their lunch to came together for 20 minutes of silence and reflection followed by poetry readings (also in honor of National Poetry Month). For over 20 years, this day has been nationally recognized by students around the country. 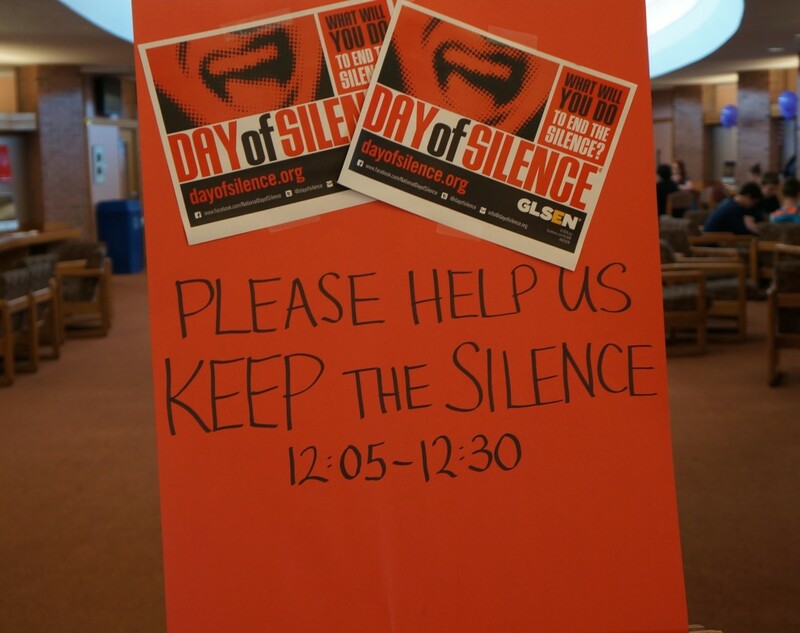 And, every spring young adults take a vow of silence to call attention to the silencing effect of anti-LGBTQ bullying and harassment in schools. For the small community that we are, we may think that we’re beyond such things: that bullying and harassment of students based on their sexuality, gender identity, or gender expression doesn’t happen in our community. That may or may not be so. Any kind of harassment costs us all. Any kind of injustice within school walls affects us all. Any kind of unkind words or actions have the potential of breaking down a person’s self-esteem, self-identity, and, even, their life. This experience has not only allowed our students to come together and support anit-LGBTQ bullying and harassment in schools, but to also experience their collective strength as a student body. This entry was posted in All News, Featured, Upper School by Communications Department. Bookmark the permalink.